Calling all children, ages 3-17! …and Student/Elder Collaborators! We will award winners in these age groups: 3-6, 7-9, 10-12, 13-17. We have also added a few categories: (NEW for 2015: Best Student/Elder Collaboration; Best 3D; Most Unusual; Best Environmental; Best Black and White; and this may expand depending on what we receive. Awards are given to 1st place, 2nd place, 3rd place and honorable mention for each age group. 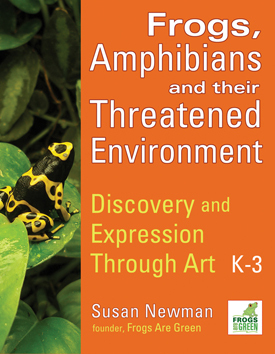 Your artwork can be about frogs, amphibians, rainforests, climate change, pollution, etc… and how you (or all of us) can help them. We’re looking for drawings, paintings, sculpture, collage, or whatever format helps you express yourself. To enter the contest, you join the kids art contest group (and this year, the right age group) on Flickr and just upload your entries. Each child can submit up to 3 artworks. Teachers can upload student’s work and parents can upload their children’s work. If you are in a country where you cannot view Flickr, you can email your digital image to Frogs Are Green along with the child’s name, age and country, and we will add the image to the group. ****Note: You DO NOT need to have an email with Yahoo to enter! Just look on the Sign In/Sign Up on Flickr and you’ll see other email options! Enter the 6th Annual Kids Art Contest for 2015 Now! For the contest, each entry MUST INCLUDE the Child’s Name, Age, and Country (and a caption if you like) or your submission cannot be judged. If entering the student/elder collaboration we’ll need the Elder person’s name and age also. 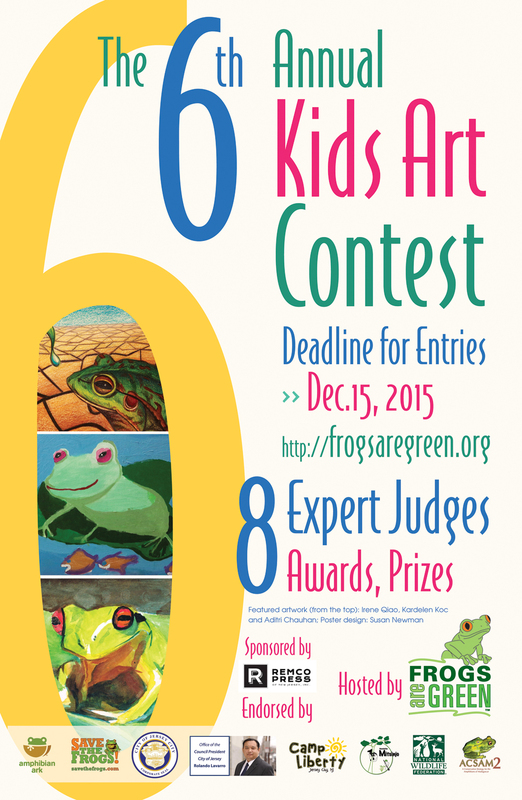 Please print out the attached >> 6th Annual Frogs Are Green Kids Art Contest poster << and post it in your neighborhood libraries, community centers and schools. Endorsed by: Amphibian Ark, Save the Frogs, City of Jersey City, City Council President Rolando Lavarro, Camp Liberty, Parc Mitsinjo, National Wildlife Federation and ACSAM 2. Countries who participated in the 5th annual kids art contest: Australia, Bahrain, Bangladesh, Bulgaria, Canada, China, Croatia, England, Greece, Hungary, India, Indonesia, Iran, Ireland, Japan, Latvia, Malaysia, Morocco, Philippines, Romania, Russian Federation, Slovakia, Slovenia, South Africa, South Korea, Sri Lanka, Taiwan, Thailand, Turkey, Ukraine, United Arab Emirate, and United States. 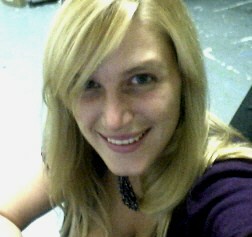 Sam has a Bachelor of Fine Arts, in Interior Design from the School of Visual Arts, NYC. She worked in a London-based Architectural firm for 7 years before moving back to the US. She is now the founder/owner of Oogaa, a company that is driven by a passionate commitment to safe and sustainable products for little ones, oogaa is dedicated to creating modern items that make mealtimes fun. 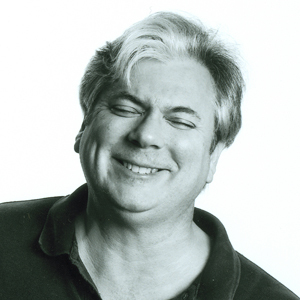 Peter Thorpe has been an illustrator and designer for over 39 years. Clients include HarperCollins, Penguin Random House, Warner Books and St. Martin’s Press. He has done book covers for many first editions of best selling books, including Lake Wobegon Days by Garrison Keillor, and 20 years of covers for Tony Hillerman’s Navajo Mysteries. His studio is in Asheville, North Carolina. Rachel has been a reptile and amphibian advocate for most of her life, and has several years of experience in managing conservation and community outreach programs for endangered wildlife, including frogs. A Texas native, she has worked with the endangered Houston toad, marine and freshwater turtles, black bears, and several other species. One of her favorite accomplishments was the creation of an interactive education program called “Toad Trackers”, whereby youth & families trained, and worked alongside biologists to get hands on experience in wildlife research through monitoring a local toad population in Houston. Rachel received her Master’s in Wildlife Science at Texas A&M University, focusing her research in Biodiversity Stewardship. 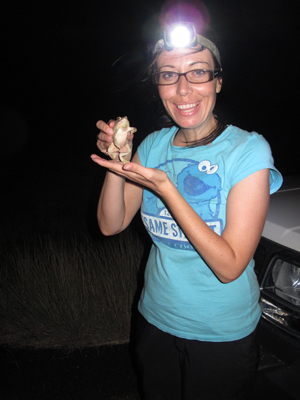 Rachel’s current affiliations with amphibian conservation include an associate position as a Community Outreach Officer with Amphibian Ark and a facilitator for the Amphibian Specialist Group’s Education & Communications Working Group. Born and raised in New Jersey, Monique decided from an early age to rebel against her math loving family and commit herself to a life in the arts. Determined to soak up as much art exposure as possible, she has dedicated the past 15 years to artistic based training, teaching and travel. In 2009, Monique was awarded the Geraldine R. Dodge Artist Fellowship, which gave her the opportunity to study both ancient and modern mosaic techniques in Ravenna, Italy, the believed birthplace of mosaic art. The experience shifted the entire focus and direction of her work and since then she has been continuously experimenting with all things mosaic; from fine art to functional installations. Monique holds advanced degrees in both Fine Arts and Art Education and has been teaching art in the NJ public school system for the past decade. She currently lives in Jersey City, New Jersey. In the 1980s Lerer edited Marvel Age, the Marvel Comics promotional fanzine, has curated exhibits at the Museum of Comic and Cartoon Art, and his cartoon illustrations defined the look of the Careers Page feature in the New York Post from 1996 to 1998. 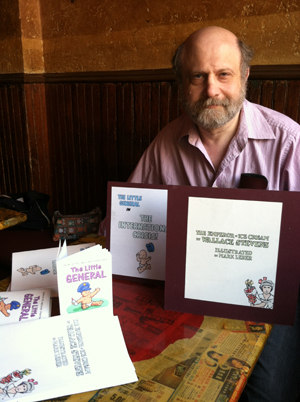 He has been delighting his fans with the adventures of The Little General (based on a concept by writer Andrew Coe), a graphic novel about whom will be appearing sometime in 2016. He lives in New York City. 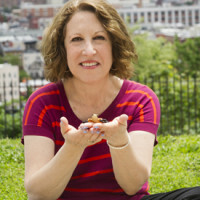 Actor and Educator, Caley Vickerman, is the founder of the Guerilla Haiku Movement, a Creative Place-making/Public Art Experience that has traveled to over 50 cities nationwide since April 2011, joining communities in spontaneous interaction and dialogue through the succinct and powerful use of haiku. 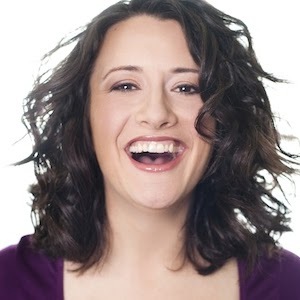 She is interested in exploring the intersections of theater, education, and community building and is constantly trying to find new ways to connect strangers meaningfully and creatively. 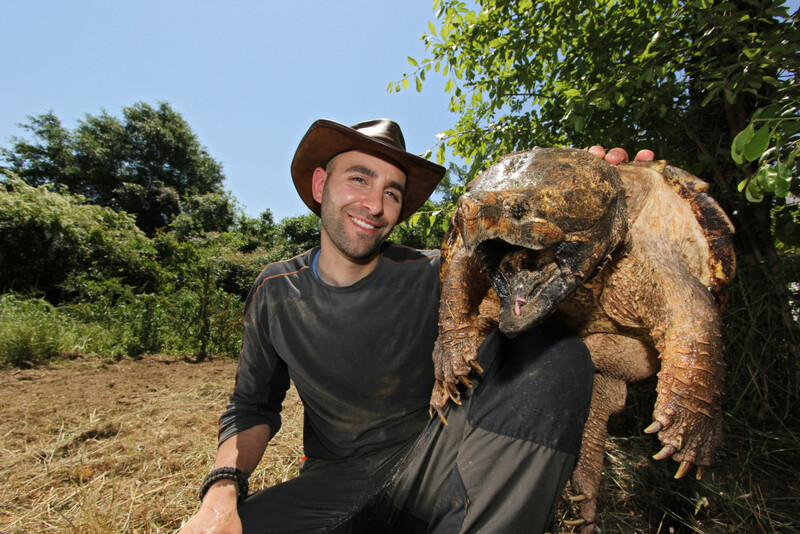 Coyote Peterson, host of Discovery Network’s hit series Breaking Trail and Dragon Tails is first and foremost an avid adventurer and animal enthusiast! Since his very earliest memories as a child, animals have played a huge role in his life. Every one of them, from the bizarre to the deadly, have led him on countless pursuits to understand their true nature and develop an appreciation for the incredible habitats they call home. To be a part of his incredible adventures make sure you subscribe to The Brave Wilderness Channel, your one stop connection to a wild world of amazing up close animal encounters! Executive Director of the Team, has been leading theater and education projects with young people since 1970. He has documented the effectiveness theater arts integration can have on academic and social student outcomes. Pop-Up Puppet Theater,” a puppet and literacy project increased the language arts test scores for over two thousand 4th grade students by 36.6%. Results from three USDOE Arts-in-Education grants (2005-2014) have shown that arts integration has a beneficial effect on academic outcomes for 2nd to 7th grade students. For this work in 2010 Carmine and three researchers from Seton Hall University received the AATE Research Award. He has also co-authored a book on drama education activities, as well as three handbooks with team teaching artists. 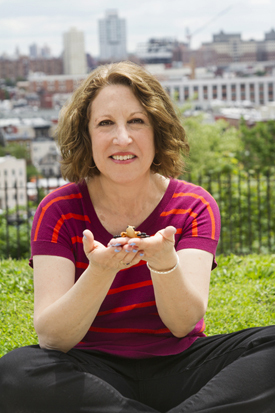 Susan Newman, a Brand Visibility Designer and environmentalist, is the founder of FROGS ARE GREEN and spends her days showing how she feels about the Earth and spreading the awareness that we need to save frogs and amphibians. A graduate of the School of Visual Arts, Susan spent her early career working as a graphic designer and art director for various NYC publishers, including Macmillan and Penguin. In 1994, she established her own design firm, Susan Newman Design, Inc., and builds brands near and far. Susan has donated her design work to various organizations including: Save The Frogs, Parc Mitsinjo, ACSAM (A Conservation Strategy for the Amphibians of Madagascar), Hoboken 9/11 Memorial Committee, Jubilee Center Hoboken for Children, The Central Avenue Special Improvement District, Actors Shakespeare Company, Hudson Theatre Ensemble, Pennsylvania Women’s Hall of Achievement and The Ring of Hope Campaign.